So what was once a seemingly straightforward mission becomes, yet again, a most complicated operation that takes Hunt and his cohorts all over the world, from Belfast to Paris to London, and eventually Kashmir, as they attempt to retrieve the plutonium and prevent three nuclear bombs from going off. And if you think things won't boil down to the last possible millisecond, complete with a red digital readout, then you're obviously not familiar with “the usual” “Mission” devices. Usual or not, one of the elements that has always kept the “Mission” movies grounded is the humanity and likability of the characters, and both of those are in full swing here, despite the absurdity of the plot. In fact, it's Hunt's decision to spare one human life at the potential cost of millions that IMF Secretary Alan Hunley (Alec Baldwin, now so hard to imagine not as Donald Trump) finds so admirable about him. The same cannot be said of CIA Director Erica Sloane (Angela Bassett), who doesn't trust the IMF and insists her own agent, Augustus Walker (Henry Cavill), accompany Hunt when he must parachute from high above Paris to meet the mysterious White Widow (Vanessa Kirby) at the Grand Palais. She's supposedly the broker between John Lark and the Apostles, but one of the running themes throughout the “M:I” movies is that, aside from the good guys, nobody really is who they say are. The reveal of each character's actual identity and loyalty is so common a ploy in this series that it's fairly easy to guess who will come out either as a savior or as a double-crosser, and the fact that it is so easy now dilutes some of the fun. 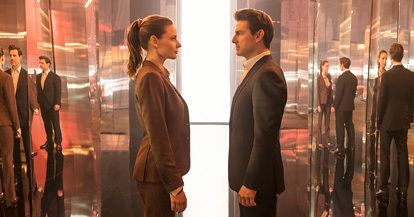 Still, the movie does have a consistent momentum, and to writer-director Christopher McQuarrie's credit (he's the only filmmaker to helm two “Mission” movies following “Rogue Nation”), he doesn't dumb things down, and the standard labyrinthine plot set by the original “Mission” continues here. But again, because such a quality has become so routine, it simply doesn't render the same effect it once did. Because we anticipate the narrative being overstuffed and convoluted, “Fallout” merely meets our expectations instead of going beyond them. The same goes for the otherwise incredible stunts and action sequences, which range from the aforementioned skydive; an intense martial arts fight in a night club men's room; a motorcycle/car chase on the narrow streets of Paris; a full-throttle run across the rooftops of London; and a superior dual helicopter battle over snow-capped mountains. Each of these is executed with great vigor, detail, and conviction, and had they been the first of their kind, “Mission: Impossible: Fallout” might have been one of the most memorable action movies in recent memory. However, as extreme, sensational and uncompromising as these sequences are, the fact remains they are not original, but simply performed to a greater degree than what we've seen before. The movie essentially takes what other action movies (including previous “M:I” movies) have done and pumped them full of steroids, and I needed it do more than just beef things up. To give you an idea, the bathroom fight, right down to the lighting design, feels like it was yanked right out of “True Lies,” while the Paris chase mirrors a similar sequence in “The Bourne Identity.” Meanwhile, as Hunt sprints across a series of roofs in London, I couldn't help but recall him sprinting at the end of “M:I:III” in much the same way. So unfortunately, the film's “usualness” (both with regard to its plot and its action), ends up costing it too much excitement value. Don't get me wrong—I fully recognize the filmmakers' technical prowess, as well as Cruise and company's ceaseless and enthusiastic dedication, but the hackneyed material ultimately undermines them and I left the theater feeling mostly underwhelmed. Still, even though “Fallout” didn't marvel me like I hoped, it did leave me hopeful, because I'm confident this same team of filmmakers and actors can apply their energy and resources to fresher, more worthy material. This should be their mission going forward, so let's hope they choose to accept it.